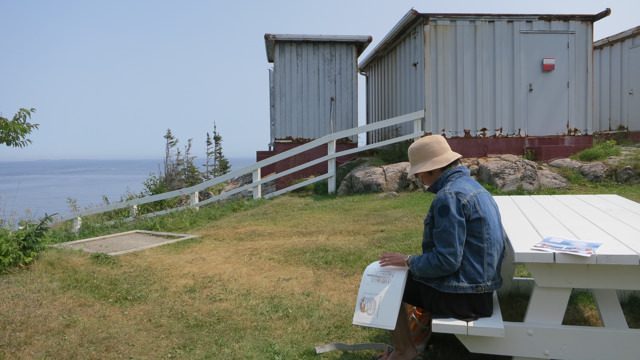 After two and a half days in Québec City, we drove up the north shore of the St. Lawrence River, stopping in Baie St. Paul (a wonderful artistic community) and then reaching Baie Ste. Catherine where the St. Lawrence meets the Saguenay River. The whole drive had spectacular views of the river, really one of the most beautiful drives in Canada, but Pointe Noire was breathtaking. 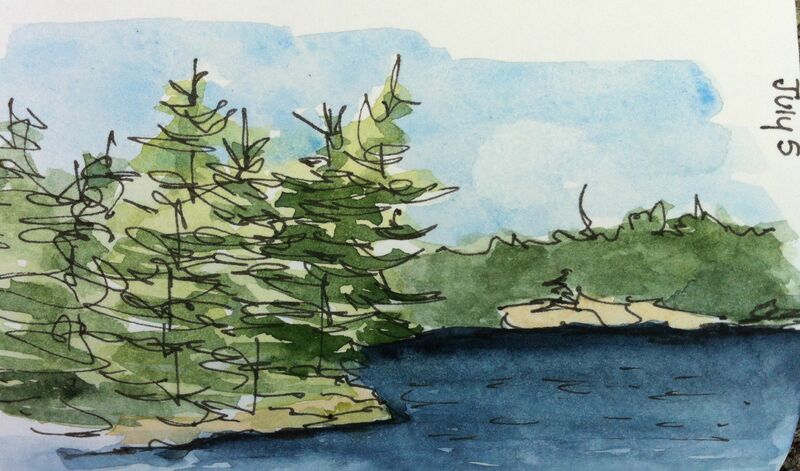 I sat on a picnic table just before we boarded the ferry and sketched the few valiant trees on the hill. The background music of the ferries’ horns and the sight of the soaring birds is still in my mind as I looks at this sketch. A short ferry ride from Baie Ste. Catherine is Tadoussac, a small town with a great restaurant, La Bohème, which is located in an old general store from 1892. 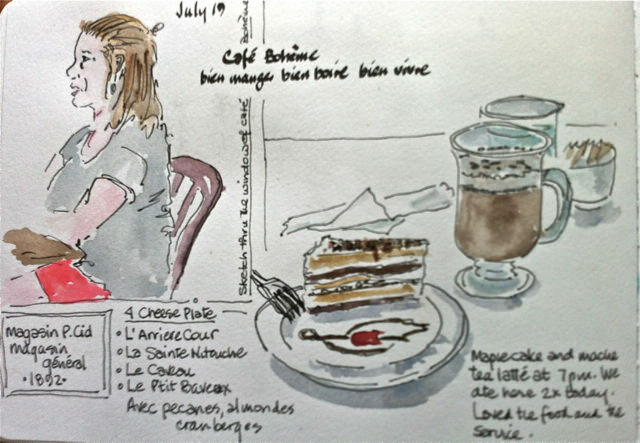 We spent a couple of days here and ate at La Bohème 3 times! 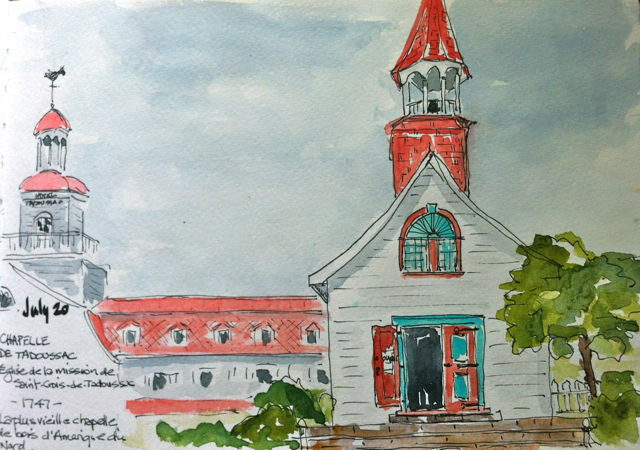 I did a bit of sketching in this picturesque place including the red and turquoise church on the shore of the river, reported to be the oldest wooden church in North America. What sketcher could resist those colours! I had my stool with me, so sat right out in front to sketch and paint. 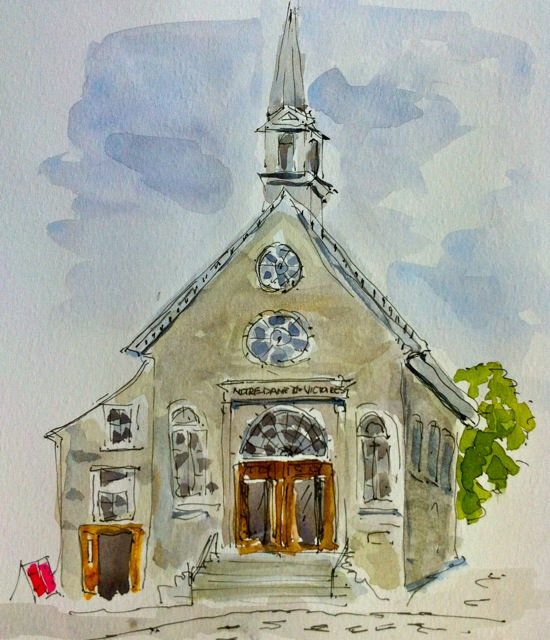 The church was visited by lots of people as it was Sunday morning, so I had many comments on my work. The town has a lovely wooden boardwalk with a gazebo at the end where I retreated to finish the sketch. Hello again! I am finally back here. We have been travelling for the last couple of weeks in Québec. I wanted to sketch everyday of the trip and to try to find comfort with my still developing skill and style. I pretty well kept to it, with some days completing two or three. 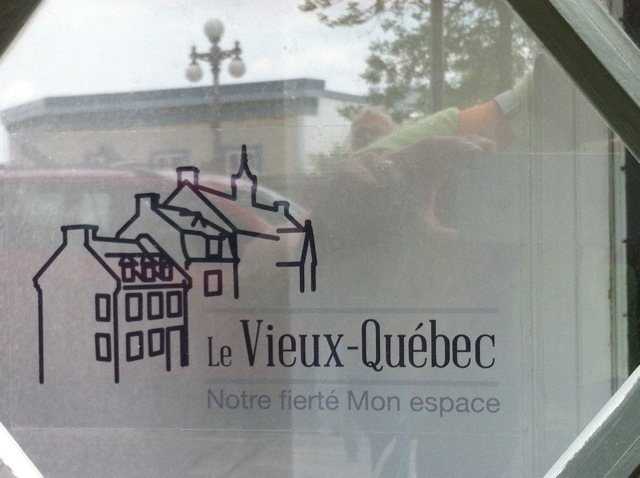 Our first two days were in le Vieux-Québec, a totally perfect place to sketch. We stayed within the city walls and wandered around amid the old beauty. I sat on patios, benches and walls and sketched. My rule was to complete the sketch, including watercolour, in situ, no matter how wonky or bad it seemed. And as I look at these, even though I cringe a bit (look at those weird people in the last drawing! 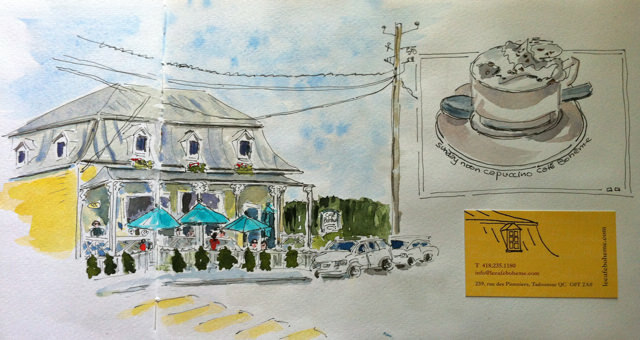 ), I can remember so much about the time I was sketching, the weather, the conversation, the taste of the latte. 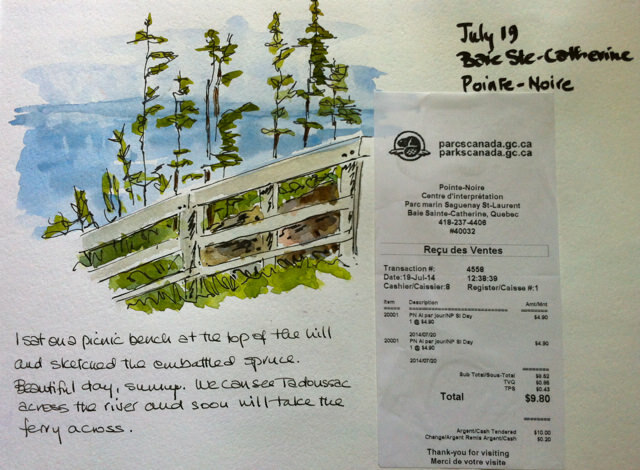 And I kept sketching all the way up the St. Lawrence to Tadoussac and Lac St. Jean, so in the coming days I’ll post some more. Meantime, it’s nice to be back here. 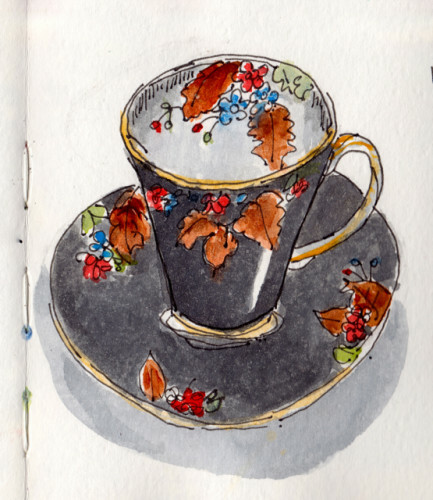 I have been inspired by Liz Steel’s approach to sketching forever. 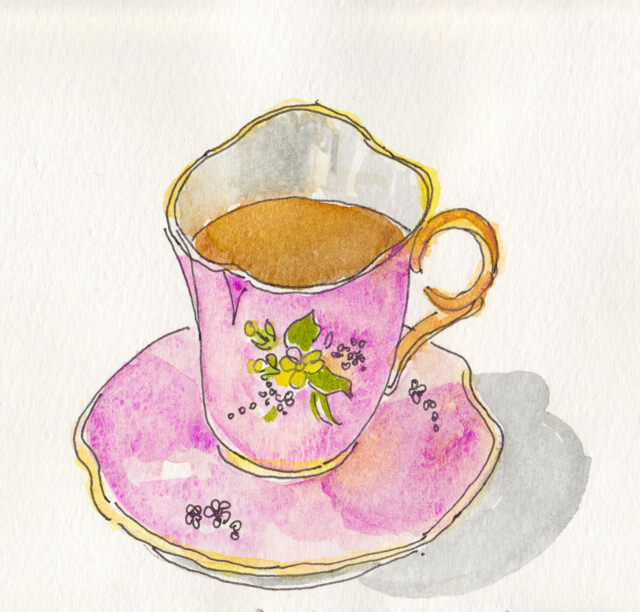 But it was her charming video (a taste of what is to come in semester 2 of Sketchbook School) that propelled me to the back of the cupboard for my very small collection of tea cups. These two cups have connections in my family; the pink one was painted by my aunt when women of a certain age did such things for their hoped-for marriages. It was great to have a chance to use Potters Pink which has been neglected in my palette. And although I never drink from these cups–well, made an exception for the drawing–I really enjoyed sketching their shape and pattern. Here is a quote from Liz’s blog which captures my feelings about sketching too: …my sketchbook journal is the celebration of the little things in life – the everyday becomes special and worthy to record and it is a great way to realize how much we have to be thankful for – even in hard times. Speaking of SBS, I watched the videos of week 2 last night and have already tried one self-portrait. This week’s assignment is various approaches to self-portraits, daily! Koosje Koene is so charming and encouraging, I almost think I can do it. I’ll be posting my attempts later this week, maybe. Here is another cottage sketch, not trees this time but fruit. The plate is vintage Hotel Quinte (now sadly a parking lot) and the fruit, you may recognize. I’m just playing with wet-on-wet and line or no-line, just having fun. I am sitting on the screened porch at the cottage, still marvelling at my access to the world from this little piece of granite. A message from Kenya popped up on my screen a few minutes ago. My mind boggles. Unlike my son who feels harrassed by his emails when he is here and is a bit compulsive about checking, I feel I can open this window to the world when it works for me and glance out. This morning the note from Kenya and the weekly message from Brainpickings. But that’s not why I am writing this morning. I am writing to say belated thank yous. 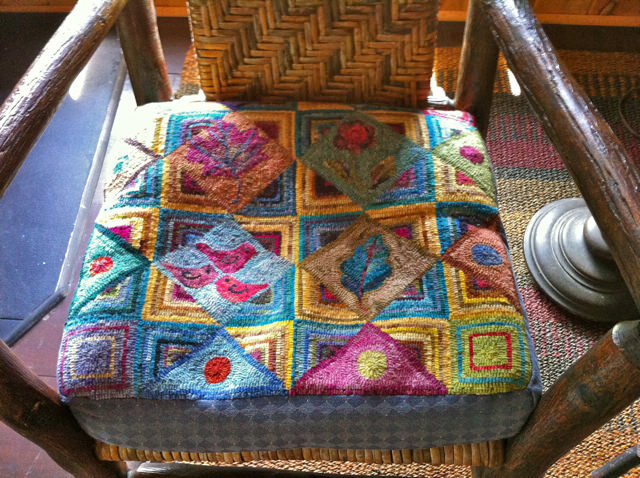 First, a big big thank you to Wendie Scott Davis, who during her wide-cut/primitives class at Trent Univeristy, sold loonie strips to support the rug hookers in Matangwe Kenya. The class raised $63.00!! This will go to materials, used t-shirts etc. that I hope to buy in the markets of Nairobi this January. 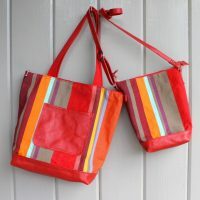 We are working to make the venture sustainable and to source the materials locally. That said, if you have burlap or hooks or fine cotton jersey t-shirts etc. please send me an email. You can find the info under contact on the right hand side of this post. The second thank you goes to one of the blog readers. 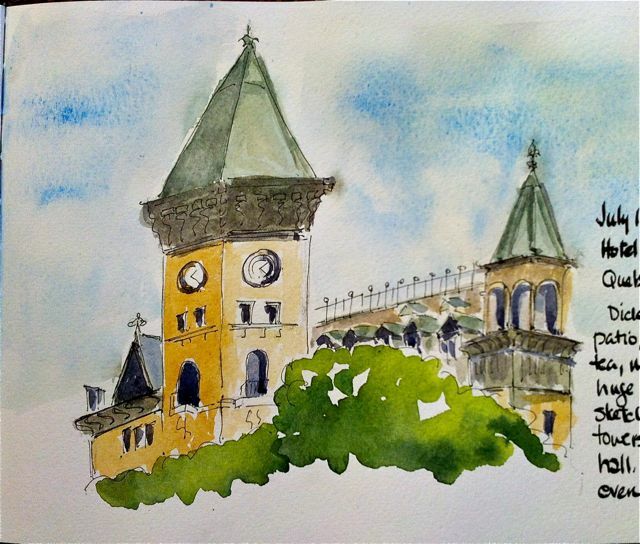 He sent me an email telling me that he had been inspired by the blog and my attempts at sketching and, as a result, had signed up for Sketchbook Skool. It’s always wonderful to hear from blog readers and to know that something you said had an influence. 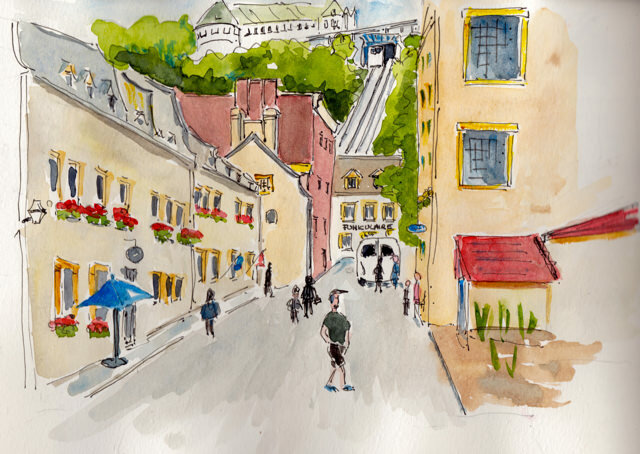 He writes: “Funny you talk about seeing things in a different way, on my way to work the last couple of weeks since I started sketching I see shapes and color everwhere, where before I only saw things and objects…SO exciting.” Very exciting. And I am about to start Semester 2 which is called Seeing, and I’m pretty excited too. More on that later in the week. Our cottage is on an island, a small island, on a big lake where the properties can only be accessed by boat. Even on a busy holiday weekend like this one, it is relatively quiet. A return to the cottage is a return to the past. Here the life jackets from our two and four year old sons (now well into their 30’s) still hang in the boathouse and New Yorkers from twenty years ago hide at the bottom of the magazine rack. At a cottage you can ignore the terrifying changes in the world and in yourself. Because this one place, this one lump of granite with its wooden cabin, does seem to be as it always was. Of course, that sense of permanence and security is illusory. This year we have cell service on the lake which brings the world in. The news is delivered to ‘our door’ just like home. But it also means I can connect with you. 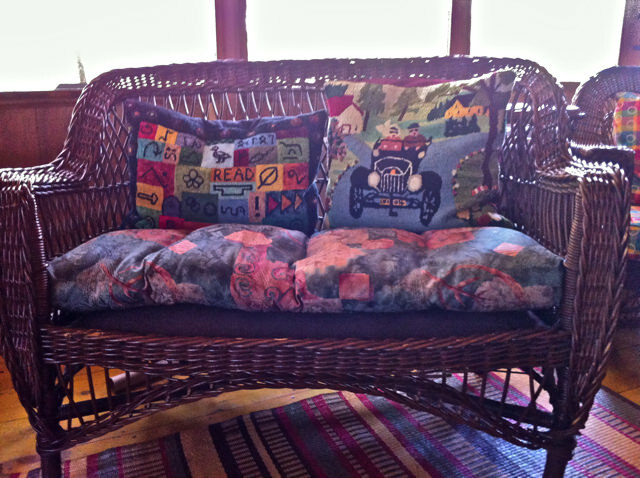 So here is a little tour of the cottage and some of the early pieces of hooking that I rediscover each year. 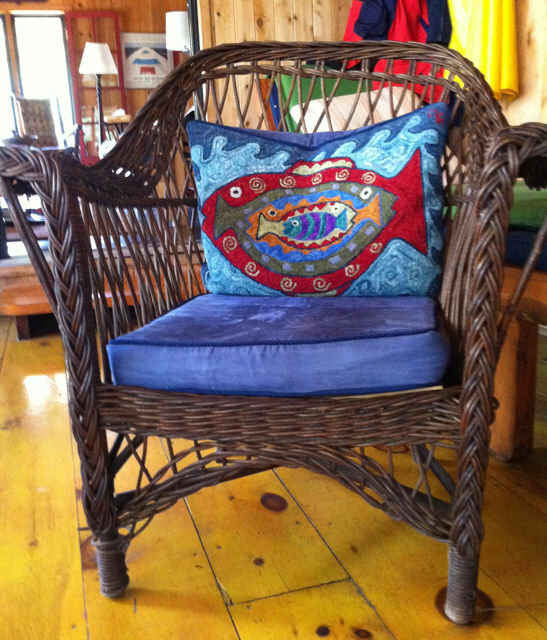 The Maud Lewis was hooked by my mother and the fish, one of my first pieces, is a pattern from Christine Little of Mahone Bay, Nova Scotia. The other two were doodles in wool, the one beside Maud, a record of each day in October 2007. Just looking at that piece, like my sketch above, evokes the feelings and the thoughts running through me as it came to be. This is power of creativity, and that is something that doesn’t change.